The good news is that anyone can do it and June is the best time to head for your deciduous trees with the pruning shears. Pruning is a huge topic and there are many different trains of thought on the subject however the following is an attempt to keep it as simple as possible. 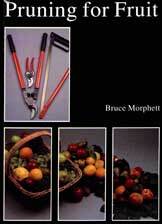 For those of you who would like more detailed information specifically on fruit tree pruning I can highly recommend the book 'Pruning for Fruit' by Bruce Morphett. It's an 'easy to read' book packed with excellent illustrations that accompany directions. Firstly fruit trees do not have to be pruned in order to produce fruit. Fruiting is a natural occurrence to ensure the survival of the tree. Many gardeners may choose not to prune. Our thought on the subject is that although unpruned trees will crop, (particularly when young), they will suffer in the long-term without proper care. And after all, we are all looking for many years of successful fruit production. There are three good reasons to prune fruit trees. Fruit trees can be trained into many forms, including espalier, vase or central leader. These training types ensure a strong framework with short and durable branches that enable the tree to carry its crop. Pruning regulates production by slowing vigorous growth of foliage to promote fruiting spurs or regulating the number and size of the fruit. To keep trees healthy and vigorous we look for "The Four D's": Diseased, Dead, Deformed, and Diagonal (crossing). Be ruthless, all of these need to be removed. It may seem severe but taking out weak branches will prevent further problems and boost the tree's immune reserves. Remember to remove any shoots that occur below the graft union. Another type of pruning is summer pruning however we will cover this in a future article. What fruit trees to prune and when? This is the perfect time to start pruning deciduous fruit trees like stone fruit and pome fruit, grapes, mulberries, persimmons, figs and kiwifruit. Pruning needs to be carried out annually to stimulate fruit production. Don't confuse deciduous fruit trees with evergreen types such as citrus that only require minimal pruning nearer to spring. The "open center" method is similar in form to a wide bowl, radiating out from the trunk. The bowl is formed by 3 to 5 well-spaced main (scaffold) branches. Frequently seen in commercial orchards this method aims for an open centre to let in air and light by removing overcrowded branches in the middle of the tree and any that are rubbing against each other. When training a young tree cut the leader back and select the new shoots that grow from below the cut for future scaffold branches. The "central leader" method. In this form, one main shoot is allowed to grow up in the center of the tree. Select two or three branches arising from this "central leader" that are pointing in different directions. The lowest branch should be at least 50cm from the ground. Cut the selected branches back keeping the lowest ones longer than the upper ones. The main stem is cut at about 1m in height. Keep all selected branches almost horizontal. Remove the narrow angled competing shoots from the top of the central stem and those near the tips of the side branches and keep the lower branches longer than the upper ones. The "vase-shaped" method. This form of pruning is suitable for all pome and stone fruit. Its final shape should resemble a wide-angled V shape. The aim is to select three or four branches at least 50cm above the ground and each pointing in a different direction. These will become the main leaders of the future tree and will be subdivided again in later years to form subleaders. 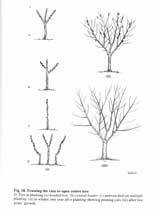 Choose the best side branches and cut the main stem back to above the level of the highest side branch selected. Prune the outside shoots to an outside bud all at about the same level. If your tree is young and doesn't have enough side branches cut the main stem back to approx 1m and select suitable branches the next year. This is a better option than using inferior branches. Pruning is the skilful balance between shoot growth and fruit production. 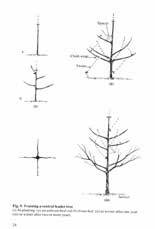 How much pruning a tree needs is dependent on the type of tree, its location, the climate, when it flowers, the size and how much fruit is produced. At one extreme are trees such as peach and nectarine that only bear fruit on stems that grew the previous season, so they need fairly severe annual pruning to stimulate a flush of vigorous new shoots for the next year's crop. Citrus trees only need minimal (Renewable) pruning as the more leaves that are on a citrus tree, the larger and more numerous the fruit. Trees such as Figs and grapes need a more specialised type of pruning. Don't be daunted by pruning. With a little bit of research (a good book, a short course or the internet) you will achieve excellent results and high yields as well as acquiring a valuable skill that you can pass on to others.